Home » Sports » The Bills Win! The Bills Win!! The Bills Win! The Bills Win!! Since today is Super Bowl Sunday, I thought it might be an appropriate day to “talk football”. 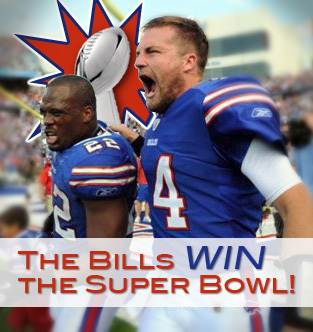 So, if you’re a Bills fan, too, or a general football/NFL fan, you’ll likely enjoy this post. If you’re not (and likely there are many of you) … I’d recommend drilling down through all the related links and category tabs here for something else to read today. So, in light of that reality: WHAT is the deal with the Buffalo Bills?! Folks are tempted to say that the Bills are just either horribly managed, or under-whelmingly under-talented. (Or would that be overwhelmingly?) And a quick look at their draft pick success rate over the now twelve seasons in which they have failed to qualify for the post season would lead most astute fans of the game to that easy conclusion. But the Great Collapse of 2011 was actually a result of more than just a lack of talent, or a poorly managed organization. Throughout the season, the Bills were “playing hurt”. Whether their guys were actually on the sidelines (or not even in the stadium) or if they were in the game but not fully healthy, the Bills were one of the teams hardest hit by injuries this year. You might say, “But every team has injuries! Man up!” And, actually, most of the players said that throughout the season. It was frustrating me a great deal to not hear the coaches, the GM, or the players saying anything about the insane amount of injuries that this team was having to deal with. In 2007, the Bills had 17 players on IR. That was just ridiculous. That was the year that Kevin Everett suffered a spinal injury in the very first game of the year. (A game we were privileged to attend.) In 2011, the Bills ended the year with 15 players on IR. Interestingly, an article near the end of the season similarly pointed out what I was seeing and saying… losing key players matters! I have sadly lost my reference to that article, but the gist was that the worst teams had the most injuries and the best had the fewest. Seems obvious, but it’s often overlooked, or downplayed as an “excuse”. And it doesn’t stop there. Just yesterday the Bills published news that QB Ryan Fitzpatrick played the last ten games of the season with cracked ribs. This is something that can affect your throwing accuracy. And a ton of guys never were injured “enough” to be put on IR, but they were less of the players they could be each week… it was just a mess. Starters were out for many games, or most or even all of the season. Promising rookies were injured for games or the season. Even the kicker was hit with a season-ending injury! There’s more that could be said here, and it’s certainly not the only reason the Bills finished with such a horrible record after such a promising start. But I contend unequivocally that it was the major reason. But… Who Are Their Players? A fine question if you’re not an avid Bills fans. Even casual Bills fans would likely have a hard time naming anyone on this current roster. That was one of their strengths out of the gate in 2011. They were a team of “cast-offs” and otherwise overlooked players. Ryan Fitzpatrick, the Ivy League perennial backup QB was right at the top of the QB stats while the Bills soared to a 5-2 start. Undrafted-free-agent-from-Division-III-Coe-College RB Fred Jackson was on a torrid pace to perhaps rival Thurman Thomas’ best seasons as a Bill, leading the league in rushing and overall yards from scrimmage on several occasions. Seventh-round pick Stevie Johnson finished the year with over 1,000 yards receiving, becoming the only Buffalo Bill ever to have back-to-back 1,000-yard seasons. (Yes, really!) And no-name TE Scott Chandler took the league by surprise with his “unstoppable” production in the red zone, leading the league in TDs by a tight end when the Bills had their early success. Add to that some equally unknown, but pretty talented young players from the Nix/Gailey regime’s first two drafts and this team felt they had something to prove. And they were doing it. One thing many of the players have said, looking back at last season, is that they were not ready to handle success. I’m not exactly sure what that means, but it has some ring of truth to it. They are all young. They have very little experience in meaningful games (and even less as the division leaders that they were at week eight). It could be that. And if so, that’s something they’re going to have to figure out this offseason. Because, if they’re not injured… there’s not much reason this team of “nobodies” can’t get out to the same great start they had last season. One thing that could really hold the 2012 Buffalo Bills back is the amount of potential turnover this team faces. Stevie Johnson leads a long list of fairly “high-profile” players (for the Bills, at least… again, see above re: how there really are no high-profile players in Buffalo) who might be free agents come March 13th. The Bills and he both say they are attempting to negotiate a contract, but no agreement has been reached just yet. If the Bills let a lot of players go, and bring in a lot of new players via the draft and free agency, that will be at least a moderate challenge. They are already going to be working with a new defensive coordinator as Dave Wanndstedt took over that role right after the close of the 2011 season. There has been a little bit of shuffling in the coaching staff as a whole as some guys were let go, some left, and new coaches have been hired. DEPTH. That’s easy. Hardly any team could have withstood the freakish injury list Buffalo dealt with last season, but they clearly need to have talented and/or experienced depth at many positions going into next season, maybe especially offensive line. SECOND WIDEOUT (AND FIRST??) If Stevie stays, then we need a second wideout. If he goes, we’ll need two. Three of the guys Buffalo was counting on this year were out for most or all of the year (Donald Jones, Marcus Easley, and Roscoe Parrish). There’s no guarantee any of those guys are even the player they want anyway. The Bills will almost definitely go after a free agent WR, or address that position in the draft. PASS RUSH. With Shawne Merriman still a BIG question mark, the Bills need to figure something out re: their putrid pass rush. When you take away their 10-sack game against the Redskins—which turned out to be a bit of a mirage, I suppose—they really produced almost no pressure at all on the opposing QBs. Marcell Dareus looks to be a good player, and we know Kyle Williams is, but they need more here (DL, LBs) so this spot will likely be addressed, too. With so many options in front of them, there’s really no way to predict what will happen with the Bills in 2012. But I will say this… they are not as far away as some think. Really. That aside, I must say the core of the young guys on this team really do show signs of life (and longevity?) that the Bills haven’t had for a while. The amount of free agents to sign seems a foreboding task, and certainly some of these guys are still hoping to fully recover from some devastating injuries in 2011. But still… the Bills are at least going in the right direction. Poor Mr. Wilson (who is rapidly nearing his turn at joining the centenarian club) must be so tired of hearing that phrase though. He needs them to “go” a bit more quickly in the “right direction”. Better still, he needs them to reach the right destination.